Look forward to a fantastic night of contrasting and uplifting accappella music featuring our latest material and a superb repertoire from the wonderful J Birds trio! 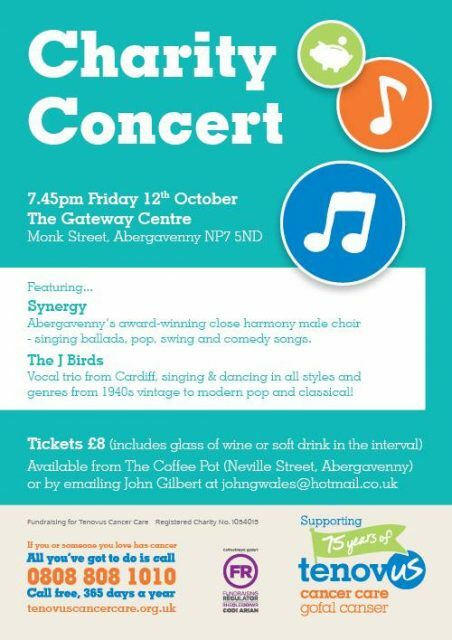 Friday 12th October, 7.30pm – 10pm, Gateway Christian Centre, Monk Street, Abergavenny NP7 5ND. Tickets £8 including a glass of wine, contact John Gilbert on 07592998259 also on sale at The Coffee Pot, Neville Street, Abergavenny. All proceeds will go to Tenovus Cancer Care.